Dual projection screens showing the same image is a bad idea. It is bad for speakers and bad for the audience. Sometimes it may be necessary but if this is the only option a good speaker needs to make changes to their delivery p3. Organisers should do their best to avoid this situation. Like many changes in presentation, dual screen projection (at the front of a presentation area) has become a thing. Like many things, becoming a thing is actually just a thing rather than something of value. A similar example is pie charts. Increasingly lecture suites are being constructed with smaller, twin screens rather than a large central screen. Organisers arrive to discover the situation and without insight do not consider the problems until the event begins. For many speakers they feel unable to make changes. 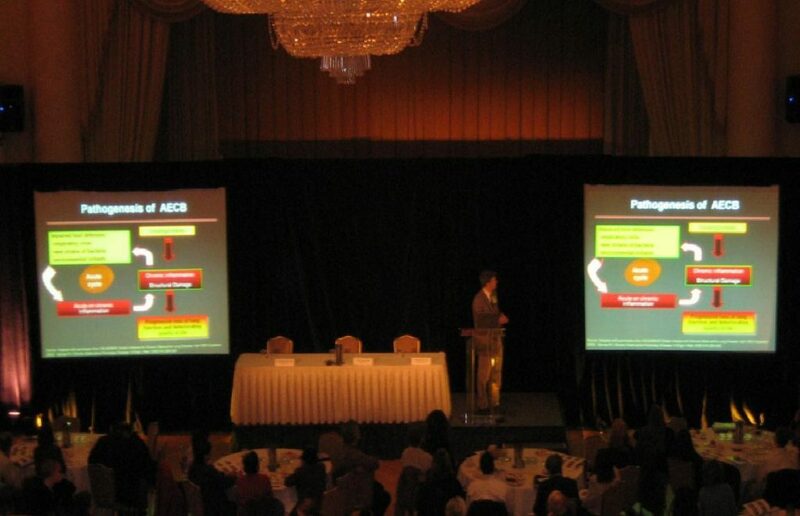 The intended value of two screens is to increase the visibility and viewing angle within an auditorium. This is particularly important in areas that are significantly broader than deep as often happens at hotel type venues. A screen is available for the smaller room but when a larger room is required, a dividing wall between two rooms is removed. The subsequent width of the room renders it difficult for those at either edge of the venue to clearly see the screen due to the obtuse viewing angle. Thus the individual screens for the room are both left projecting the same image at a much narrower viewing angle. For large auditoria two screens on the stage does not help in any way. Additional satellite screens further back provide visuals but leave the audience effectively watching a TV feed of the p2 and completely losing the value of a live speaker, particularly if the slides are read verbatim. A speaker who does not seek to change this set up needs to recognise that the directed view of the audience is less under their control than normal. Highlighting images on a screen presents significant issues, engagement with the audience is a major challenge and, without microphone support, even speech may be inaudible. A constant rear view is not flattering and will further disengage the audience at the non-chosen side of the auditorium. Dual projection is bad for the speaker. Before taking the stage consider if it is necessary due to the shape of the auditorium to have dual projection. Consider even if it is essential to show the p2. If it is possible/reasonable to have one of the screens turned off (as in the situation above), do so. If it is necessary to show the p2 then the speaker needs to make the adjustments for the benefit of the audience. This involves movement, a lot of movement and more specific engagement with sections of the audience than would normally be the case. This means a roving microphone and leaving the podium behind. Effectively each section of the auditorium needs to feel that the speaker has come to speak personally to them. The least favourable position is central because any turn will exclude at least half of the audience. The diagram below gives a suggested plan. The moves are best undertaken during slide transitions or at predetermined steps within the presentation. Dual projection is poor for an audience and a challenge for a speaker but with some forethought can be addressed to ensure a good presentation.